A successful Talent Acquisition strategy is based on three fundamentals – attracting talent, engaging them during the process and selecting the right fit. Technology and social media has been a great facilitator – online talent communities, social collaboration and social hiring platforms have changed the game of recruiting but attracting right talent still remains a challenge for organizations. People now think beyond money at work. Growth opportunities, reward & recognition, work-life balance and employment security are the things that candidates learn much before applying for a job in any organization. So how are organizations keeping up with attracting the best talent that stays? 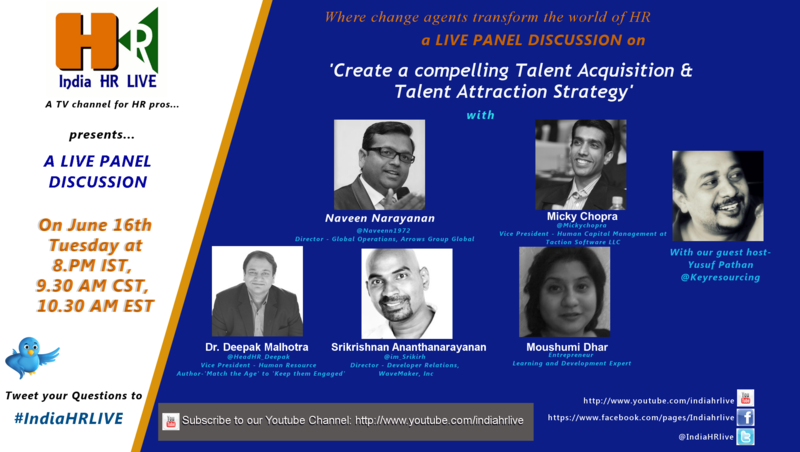 Join our guest host Yusuf Pathan, @Keyresourcing, Director at Key Resourcing with our expert panelists Naveen Narayanan, @Naveenn1972 Director – Global Operations, Arrows Group Global; Micky Chopra, @Mickychopra Vice President – Human Capital Management at Taction Software LLC; Srikrishnan Ananthanarayanan, @im_Srikirh ,Director – Developer Relations, WaveMaker, Inc; Dr. Deepak Malhotra, @HeadHR_Deepak, Vice President – Human Resource & Author. ‘Match the Age’ to ‘Keep them Engaged’ and Moushumi Dhar, Entrepreneur, Learning and Development Expert. 1. What are some Talent acquisition initiative that help organizations attract the best talent globally? 2. What influence does employer branding have on attracting talent and what are some ways to maintain that? 3. What influence does employee valve proposition have on an organization’s hiring strategy and results? 4. What candidates really look for and expect from a new job or career move? How the expectations have changed in the past years? 5. What should be the role of recruiters and hiring pros to drive a successful talent attraction strategy for an organization? What skills would you suggest for them to be most effective and productive? Anant Kumar Pandey on WhatsApp as Social Recruiting Tool!! You must be kidding!!! Jagadeesh on WhatsApp as Social Recruiting Tool!! You must be kidding!!! Sushma on WhatsApp as Social Recruiting Tool!! You must be kidding!!! Prabhakar on WhatsApp as Social Recruiting Tool!! You must be kidding!!! Sreedipto Roy on WhatsApp as Social Recruiting Tool!! You must be kidding!! !